The outdoor side table is one of the most essential furniture in a patio or backyard. Different kinds of patio side table help you to increase the looks of your house. Not only for decoration, but these outdoor side tables are also used for many purposes. You can put a flower pot on it or keep your books & magazines. Basically, outdoor side tables are smaller than other patio tables such as coffee table, bar table or dining table. Side tables can be easily carried here to there. Because these type of tables are not heavy. There are many benefits of an outdoor side table, we will discuss that later. We just love the shape and design of this patio side table. Surely, its beautiful craft model on the table-top surface will attract your guests. This patio furniture is made from cast aluminum material. The whole construction comes with five stage powder coated finish. so this side table is 100 percent rust free! You don’t have to think about its durability. It can bring a royal feeling to your deck or patio. These patio side tables can be used in both indoor and outdoor. 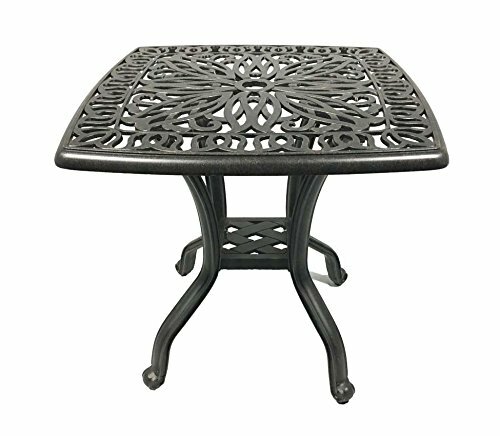 The lightweight cast aluminum frame of this table makes rearranging your patio furniture easy. The total dimension of this end or side table is W21 inch x D21 inch x H21 inch. This square side table is not too small or not too large. So it can be a perfect size for any kind of deck or patio. This metal outdoor side table looks great between two patio chairs. This patio side table features adjustable levelers on the feet. With the help of these movable levelers, you can properly set up the table legs on the floor. We also found an umbrella hole in the center of the table where you can stand a small patio umbrella. It will be very easy to assemble this side table with the included instruction. The desert bronze table frame requires very low maintenance care. Made of lightweight cast aluminum materials. Five stage powder coated finish, 100% rust free. Perfect size for any deck or patio. Comes with adjustable levelers on the feet. Easy to assemble and need low maintenance care. This set of beautiful side tables can be a wonderful way to improve some color to your outdoor summer décor, backyard or patio. If you are looking to add a sprinkle of color to your patio, look no further. These iron tables feature a lattice design. These patio side tables are both stylish and lightweight. You can move the side table all around as much as you want. It will be a proper place for your drinks and snacks. These well-constructed tables are so much perfect for small patio or deck. You will get two different size outdoor side tables in this package. The total dimension of the large table is 14.25″D x 14.25″W x 22.00″H and the small table dimension is 11.75″D x 11.75″W x 18.00″H. These sturdy side tables are made from iron materials. 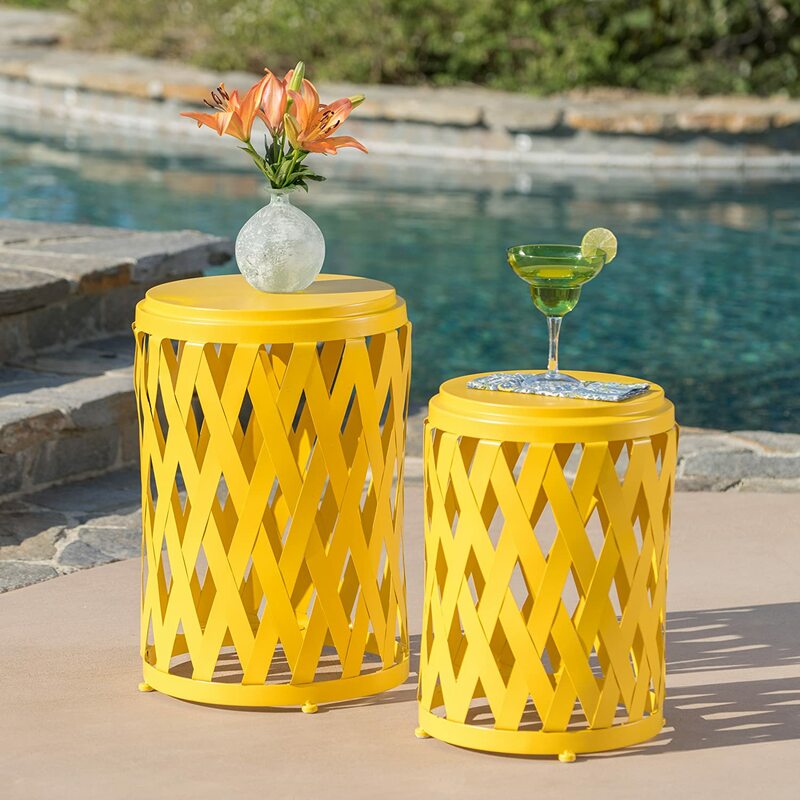 This small round outdoor side table set is available in matte green, matte blue, matte yellow or matte teal finish. So you can choose the suitable one which will match your patio. You don’t have to assemble these outdoor side tables which may save your time and effort. This robust furniture comes with a very easy storage facility. Simply hide the smaller table under the larger table and save some extra space. It also gives you a replacement guarantee. Perfect for outdoor summer decoration. Strong and sturdy construction frame. The color, the design and the price all are outstanding. Not fade resistance under the hot sun. If you are a teak wood lover or if you have some wood furniture, then you should buy this teak wood side table to fulfill the decoration. Because it will match with all kinds of outdoor teak furniture. This brand is well-known for a preeminent source of the finest teak wood and handwoven furniture. They produce all handmade furniture by skilled artisans. This square table can be a sturdier alternative to some lightweight end tables. These tables are handmade from only grade “A” weather-resistant teak wood and specially prepared to withstand the harshest outdoor elements. It can be used in both indoors and outdoors in any climate. This side table is perfect for decks, porches, balconies, patios, poolside or the beach. With the two shelves, this stylish side table also provides extra space to hold anything you need to enjoy an outdoor event. Most of the customers are impressed with the workmanship that went into this small outdoor side table. 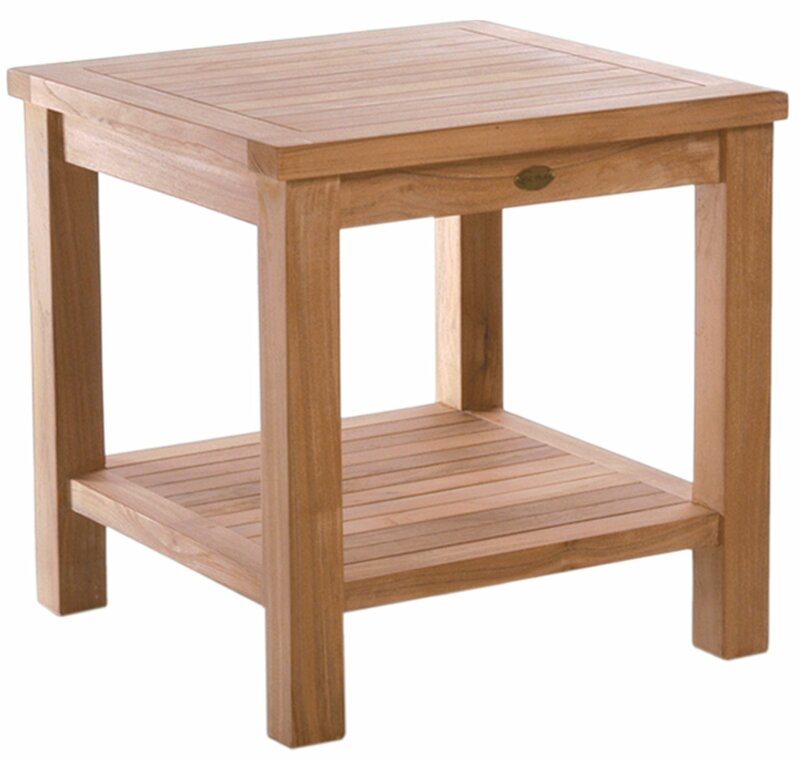 This patio side table comes with durable construction and quality craftsmanship. All of these tables are fully assembled with premium stainless steel hardware. So you don’t have to think about assembling it. The dimensions of the tables are 16″ (L) x 16″ (W) x 18″ (H). This pest resistant teak wood furniture is sturdy enough for commercial use. Solid, sturdy, and aesthetically pleasing. Bottom shelf for easy storage. Also can be used as a shower stool. Handmade from A-grade premium teak wood by skilled artisans. Space saver and matches all outdoor teak furniture. May need to recoat it with teak sealer after a long time use. This side table is multifunctional furniture and it can be used as a tea table. These durable and stylish tables are ideal for serving snacks and beverages. It’s made from PE rattan materials and constructed with the solid heavy-duty steel frame. The iron frame comes with powder coated finish which is rust-resistant and steady. There is also a tempered glass on the top surface of the table. The glass is very thick and it is gripped by 4 suction-cups to the surface. So it would not break unless you dropped it on concrete or pavers. We will suggest this gorgeous-looking side table at a great price. This side table includes a bottom shelf which allows some extra space. You can put some small things like books, magazines, fruit basket, drinks glass etc. This small patio side table can support dishes but may sag slightly. The weight of this outdoor side table with storage is about 13 pounds, which is enough portable to carry here and there. You can place this furniture item in your garden, balcony, corridor, living room or anywhere you want. The total size of this outdoor table is 18.5inch x 18.5inch x 18.5inch. You will get all the screws and a small tool to assemble this table. With the help of these tools, you need to assemble this wicker patio small table. The instruction manual is also provided in the box. This item adheres to Amazon return policy. It matches all the wicker furniture. Easy to assemble with the provided hardware. The price is so much reasonable. Comes with easy-to-clean tempered glass top. Available in black or brown color. The top webbing may sag slightly without the glass top. We are sure that you would not found this type of table after a long search. It achieves our expert’s hearts when they observed the whole thing. This is the wooden table which instantly mounts over a deck or balcony railing to provide a platform for dining, a party’s drink station or a card game. This table is made from naturally water-resistant acacia stained to impart a golden luster to the wood. 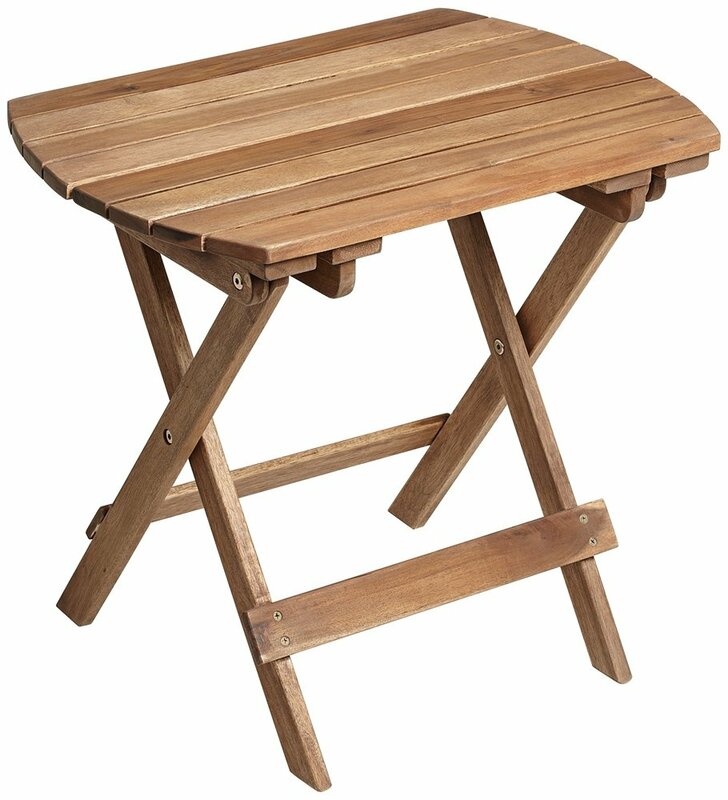 This deck table easily unfolds to a 23 1/2″-wide x 17 1/2″-deep adjustable platform. It hangs between 3-inch to 8inch below a railing’s top. This table is constructed with 16 wood slats which are spaced 1/8″ apart. Its rear frame forms twin wooden hooks which are 26 1/2″ apart. Each of the wooden hooks can fit over a railing from 2-inch to 10-inch wide. The lower half of these outdoor side tables rests against a balcony’s wall or a deck’s vertical posts. This table provides ample space for two dining plate sets. With a built-in single-arm angled support structure, this outdoor side table supports up to 40 lbs. This brand exclusively offered this beautiful wooden furniture. It’s very easy to assemble this fabulous side or deck table. You can’t get a good product like this table at a very cheap price. Instantly mounts over a deck or balcony railing to provide enough space. Made from water-resistant acacia stained wood. Hangs between 3″ to 8″ below a railing’s top. Available at a cheap & reasonable price. It supports up to 40 pounds. Only usable at balcony or deck railings..
Till now we don’t discuss folding side tables. That’s why we are suggesting this side table for those peoples, who don’t have enough space on the patio. You can store this table in any corner of your patio by folding it. This charming folding side table has a wooden slat top design that wears an understated natural finish. These outdoor tables are simply styled and perfectly designed for your patio, deck or backyard. This patio side table is made from natural acacia wood construction. Every piece of these tables includes galvanized steel hardware and specially treated for outdoor use. This side table is 18-inch high, 20-inch wide and 14-inch deep. The wood folding table is prepared for outdoor and indoor use. This furniture folds up for easy storage and arrives fully assembled. So you don’t have to waste your valuable time for assembling it. These tables are available in three different shapes. All the shapes including fish design and pineapple design are so cute. The weight of this patio furniture is about 8 pounds. So that you can easily carry it here to there. It provides a kind of carrying handle on the top for easy transport. It holds books and everything from teacups to water glasses with no difficulty. Very solidly made and easy to unfold and clasp. Nice quality wooden table for a very reasonable price. Galvanized steel hardware specially treated for outdoor use. Lightweight, convenient to carry and transport. Probably need to add a little tongue oil once a year if you keep it out in the outside weather. These patio side tables can be an ideal addition to any patio or poolside. This table is a complete package with an ice bucket for keeping your drinks cool. An ice bucket cover is also included to cover the bucket. It is made with top quality faux wicker. The structural frame of this end table is made from iron material. This accent side table comes with a brown wicker finish. It will easily match any decor you have in your patio, garden or backyard. This wonderful patio side table is both sturdy and stylish. 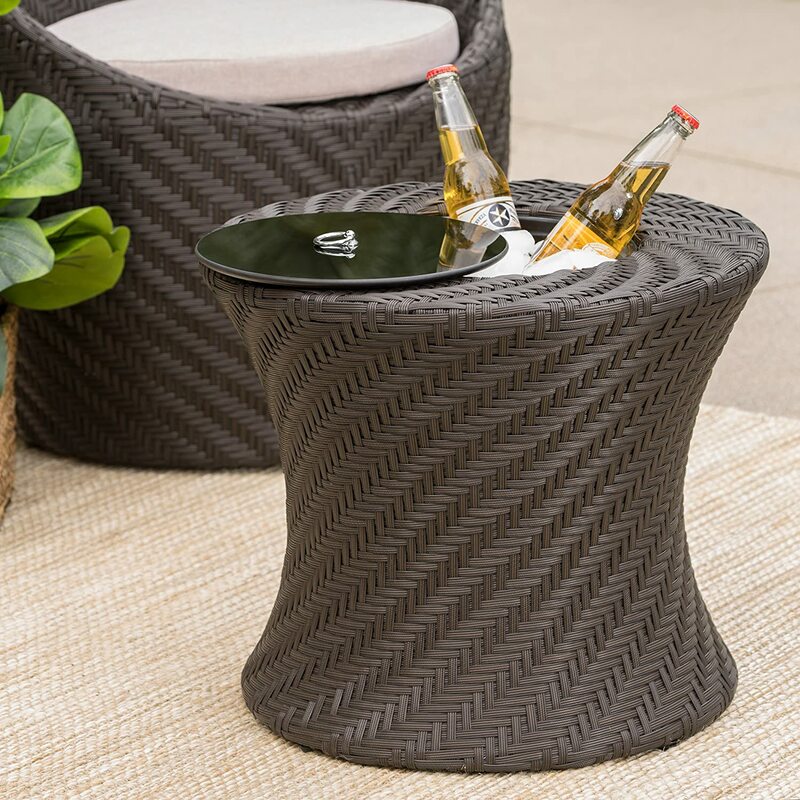 This outdoor wicker side table arrives as an assembled furniture and no assembly is required for this. You can pair it with two chaise loungers to create a piece of paradise at your poolside. The total dimension of the table is 20.28″D x 20.28″W x 16.54″H. So this side table can be used for the small or large patio. If you want something lightweight and classic, then it should be the best one for you. Comes with an ice bucket for keeping the drinks cool. Made of best quality faux wicker. Can be an ideal addition to any patio. The structural frame made from sturdy iron material. Easy to carry and no assembly required. Not easy to clean or wash the wicker table. 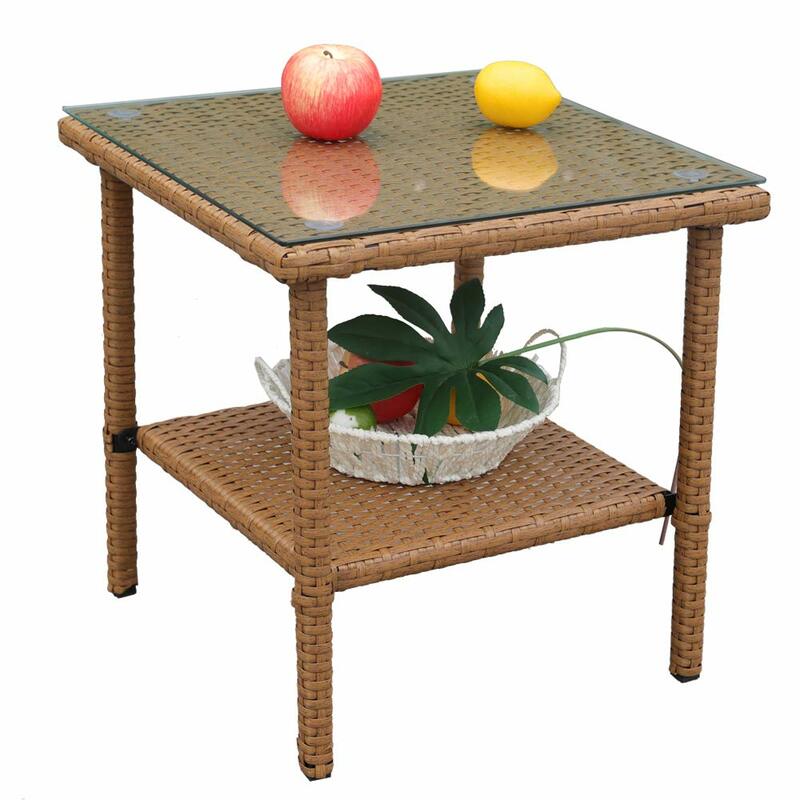 We always try to provide different kinds of outdoor side table reviews. So that you can choose the right outdoor side table which shall be perfect for you. Each of these tables is different from the other tables. Hopefully, you will get some help from our expert reviews and choose the best side table that you are looking for. Now focus on the following expert reviews if you want to purchase the best outdoor side table.